This article describes the concept of a Customer Journey Map in a practical way. After reading you will understand the basics of this powerful marketing and customer management tool. It’s extremely important for a commercial company to know what customers due throughout the entire buying process. When did they interact with the company and how did they make their final choice? It’s also important to find out which of the available communication channels they’ve used. You can make Customer Journey Map to gain more insight. Everything from the moment a new customer first encounters a commercial company, for instance online, through an ad or at a trade fair, until the moment that customer makes a purchase are tracked by a Customer Journey Map. It even clearly shows the moment a customer becomes an ambassador for the company by spreading free word-of-mouth advertising until the time the customer says goodbye to the company. All this information enables companies to improve and to become (even) more customer-friendly. The Customer Journey Map illustrates how the customer first came in touch with your company. That is done with so-called ‘touchpoints’; the places and times a customer is given the opportunity to learn more about the company and contact it. By mapping the customer experience, companies will be able to better match their marketing to the buying process. As soon as a possible customer (a lead) becomes a customer, other issues come into play. Their experience with the product or service is one of those aspects. However, the way in which they are approached by the company also plays a huge role. The previously mentioned touchpoints allow you to find out where the customer got information and what that information was. Other departments within the organisation also play a major role in this process. Working with a Customer Journey Map has several advantages. First of all, the Customer Journey Map will provide the company with insights into the needs of the customer and their interaction moments with the company can be easily identified via touchpoints. This will also provide the company with insights into internal processes so they can be changed if necessary. A Customer Journey Map also enables a company to work on an optimal customer experience. The most important thing is to find out how a customer experiences the service. Therefore, it helps to select a ‘journey’ that has not gone all that smoothly in order to improve it. It is also important to know for which department the Customer Journey Map is intended. A marketing department may have a different goal in mind than a production department. You should also determine what the information will be used for. Do processes in the company need to be improved or does the level of customer satisfaction need to be improved? By providing insight into how the Customer Journey Map will be used, a company can focus on for example, improving the website or optimising the online customer experience. By involving all the departments from the start when making a Customer Journey Map, it becomes a shared responsibility. It is important to devote a lot of attention to possible crucial bottle necks. Suppliers who can provide an important contribution should also be involved in the Customer Journey Map. It only makes sense to start the research when all the parties involved share the same ideas about the service which the company aims to provide. It is a good idea for the company to determine beforehand how they wish their customers to look back on their first experience with the company. Touchpoints: These are contact moments a customer has with the company; this can be through the website, a phone call, a conversation etc. Points of pain: These are interactions which a customer associates with a negative experience; for example, a waiting time that was too long or the phone not being answered. Points of delight: These are interactions which a customer associates with a positive experience; for example, a complaint which was handled well or unsolicited advice that was helpful. Key moments of truth: These are the points of pain or the points of delight that really matter. A contact moment that the customer experiences as extremely bad which causes you to lose the customer, provides very useful information. The emotion the customer has during the whole buying journey must be included in this component. Every company has different types of customers, each with their own preferences. By identifying who the Customer Journey Map is being created for in advance, a company can respond to specific customer wishes and needs in a better way. It helps to make a persona for this purpose; a fictional character of a stereotypical customer. This fictional character is given a name, a particular profession, age, hobbies, ambitions and frustrations. This will help to assess how the customer can be helped more effectively. For example, one customer might prefer to communicate by phone, while a different customer prefers digital contact. If your company has a large, diverse group of customers, it is best to create multiple personas. In order to collect even more information, it helps to interview customers who meet the profile of the persona. This can show us the goals they had in mind, their expectations and their opinion about the touchpoints they have used. They can also be asked how they value this touchpoint and which emotion they associate with the interaction they had with the company, business, product or service. Qualitative 1-on-1 interviews can also be supplemented with quantitative questionnaires. The collected information from the previous steps provides better insight in all of the individual interaction moments. By putting all these touchpoints on a timeline, the Customer Journey Map will provide a bird’s eye view. As everything evolves around the perception and emotion of the customer, it is smart to describe how the customer felt at each touchpoint. This emotion can be linked to a satisfaction score. The customer journey is now complete; the communication channels, touchpoints and customer satisfaction have been put on a timeline. Now the real work begins. Based on the Customer Journey Map, you can determine which improvements are needed. It is a challenge to improve touchpoints associated with a negative emotion and to maintain those associated with a positive emotion. Points for improvement will undoubtedly be raised that require a more thorough approach. A Customer Journey map is not a final goal, but a means with which you can continuously assess if the service meets the customer’s expectations. A Customer Journey Map will allow a company to identify bottlenecks and determine what it needs to address in order to make both short and long-term improvements. It is also good to consider the possible impact of improvements and changes. The goal is to draw up an action plan, which specifies tasks for the various departments. If parties make clear agreements with each other in a company, a company will be able to improve itself continuously. What do you think? How do you describe the journey of a customer? Do you recognize the practical explanation or do you have more additions? 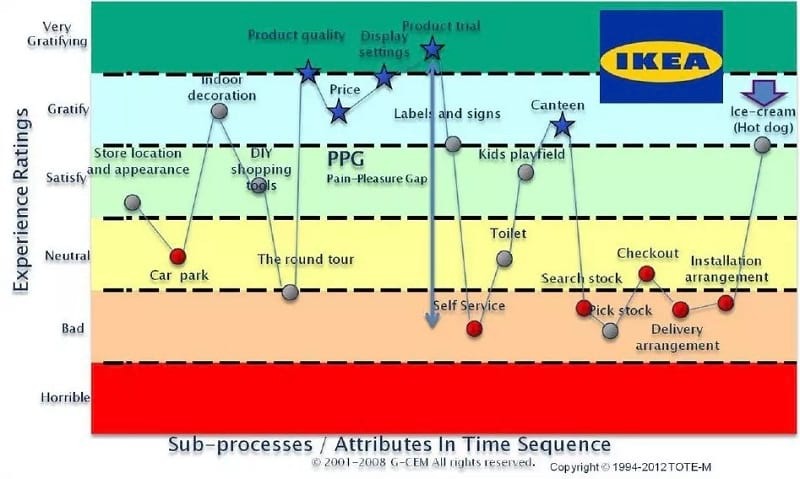 What are your success factors for visualising the journey of the customer though Business Processes? Johnston, R. & Kong, X. (2011). The customer experience: a road-map for improvement. Managing Service Quality: An International Journal, 21(1), 5-24. Lemon, K. N. & Verhoef, P. C. (2016). Understanding customer experience throughout the customer journey. American Marketing Association. Richardson, A. (2010). Using customer journey maps to improve customer experience. Harvard Business Review, 15(1). Temkin, B. D. (2010). Mapping The Customer Journey. Forrester Research.